House Speaker Paul Ryan will leave office in January likely without having achieved two of his top health policy priorities: repealing the Affordable Care Act and tackling entitlement reform. The Wisconsin Republican confirmed Wednesday that he won't seek re-election in November. He is now one of 38 sitting Republican House lawmakers who won't seek re-election in a cycle that retiring Rep. Charlie Dent (R-Pa.) described as a referendum on President Donald Trump "and his conduct in office." Ryan leaves an uncertain legacy when it comes to healthcare policy. Ryan, who chaired the House Ways and Means Committee before accepting the speakership in 2015, and the House Budget Committee before that, had long championed ideas like premium support for Medicare, block-granting Medicaid, and overhauling Social Security and welfare as well as the tax code. In his less than three years as speaker in a united GOP government, his most significant accomplishment was passage of the GOP tax bill in December. Last March, Ryan was forced to wrangle a divided caucus as Republicans sought to capitalize on Trump's victory and finally repeal the ACA. Facing opposition from the far right, he had to pull the American Health Care Act from the floor rather than see it go down in defeat. House Republicans eventually patched together compromise language, but the bill passed narrowly. The repeal effort died in the Senate. Both House and Senate plans would have curtailed Medicaid expansion and created block grants to states. While Ryan has walked a fine line in dealing with Trump, the administration has been more successful in injecting more conservative ideas into the ACA, including association health plans and other concepts that the speaker promoted in late 2016 as part of his "A Better Way" plan. The Trump administration is also curbing Medicaid expansion through approving work requirements in Indiana, Arkansas and Kentucky. A host of other states have work requirement waivers pending. It was Trump who halted cost-sharing reduction payments, which had continued to flow after the GOP-led House sued to stop the Obama administration from paying them to insurers to assist low-income enrollees with their co-pays. While Congress failed to repeal the ACA, expansion of short-term, limited-duration health plans and the GOP tax bill's elimination of the individual mandate penalty have dismantled to some extent the Obamacare plan of a single risk pool. Yet as Ryan bows out of Congress, House Republicans find themselves in a tough messaging place. Healthcare remains a hot-button issue for voters and with a potential leadership vacuum, it isn't clear what ideas the party will coalesce around as individual market premiums are due to spike again just before the November elections. "Right now, the messaging is in a difficult spot," said Dan Holler of Heritage Action, the lobbying arm of the conservative Heritage Foundation. "Republicans ran on repeal-and-replace for multiple seasons, and now they hold everything and they did not accomplish that. If premiums end up spiking prior to election time, Republicans will get blamed for that, fairly or unfairly." The Heritage Foundation is hoping repeal-and-replace as a concept is not dead, as do conservative House Republicans. Holler said although eliminating the individual mandate penalty and expanding short-term plans represent a victory for conservatives, Republicans need to make a statutory change for them to have a real effect. "States are trying to do things on the margins, within the flexibility they have to keep down costs," Holler said. If Republicans keep the House and Senate, he said, they will need to have a much more narrowly targeted message on a "replacement" plan. On entitlement reform, House Republicans are talking optimistically, but focusing on a smaller picture as the clock ticks toward the midterms. "It is a push right now," Rep. Mark Meadows (R-N.C.) said of the status of talks about potential legislation. "They're trying to look at small entitlement reforms." Meadows and other lawmakers and aides said this will likely take the form of work requirements for single, able-bodied adults on food stamps, which would pass along with the upcoming reauthorization of the farm bill. The other congressional milestone Ryan helped to steer is the $1.3 trillion two-year spending bill passed last month. But the scale of the deal riled House conservatives concerned about domestic spending. 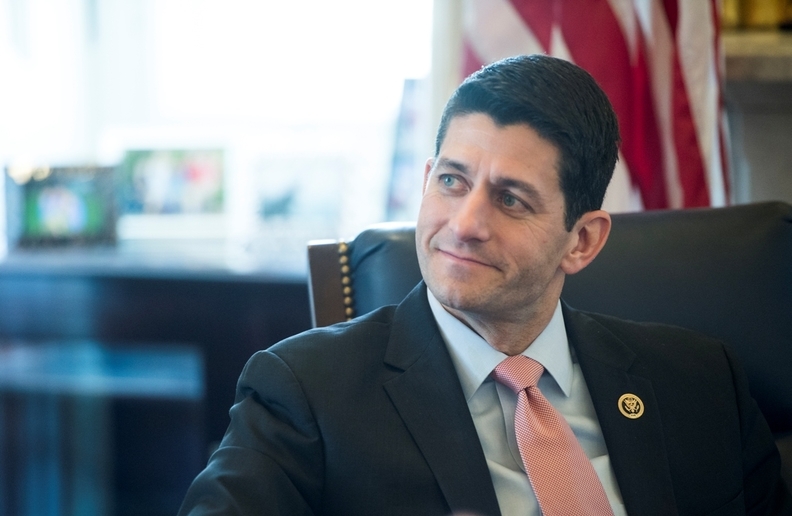 Now they are hoping, along with the White House, to rescind parts of the domestic appropriations in a move that shows the constant push-pull between them and Ryan. That effort could gain momentum as House Majority Leader Kevin McCarthy (R-Calif.) builds support for a potential run at speaker. While the White House Office of Management and Budget is working on specific proposals now, a House GOP aide close to discussions said the $20 billion in cuts being sought likely will not touch on healthcare spending but will focus on clawbacks of unspent disaster funds. Yet the omnibus and the GOP tax bill contribute to a budget deficit that will approach $1 trillion next year, according to a new analysis from the Congressional Budget Office. These numbers are a bitter pill for a Republican like Ryan who decried funding spending levels under President Barack Obama, with the deficit ballooning even though the GOP now holds both houses of Congress and the White House. A breakdown of the CBO analysis by the Committee for a Responsible Federal Budget projects that the U.S. debt will surpass $28 trillion over the next decade, more than a $13 trillion increase, and account for more than 96% of GDP by 2028. When pressed about the trillion-dollar debt increases during his tenure, Ryan dodged the question and instead returned to his record on entitlement reform, saying that he has normalized conversations about the need for them. "Entitlement reform is the one other great thing I've spent my career working on," Ryan said Wednesday.